Prescription Orthotics: How can they help me? From bio-mechanical assessment to prescribed insoles. Prescription orthotics are insoles developed specifically for your feet. It goes without saying that they should be custom made by an experienced podiatrist. If the interaction of your foot with the ground is out of the normal range, then a bio-mechanical assessment will tell your podiatrist what can be improved. Quite often, this abnormal interaction with the surface will cause discomfort, particularly when you walk or run on a regular basis. 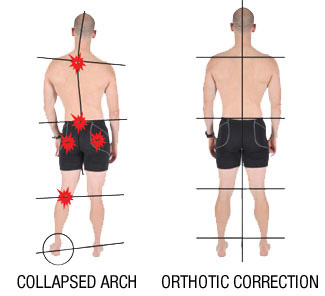 Prescription orthotics can improve your posture, your comfort and your performance, whether your motion range is linked to a leisurely stroll or high-performance sports. The custom insoles are designed to match the exact shape of your foot. We achieve this through the use of 3D scans to guarantee 0.1 mm accuracy. In other words, we start with a very accurate visualisation of your foot. The goal is to redistribute the weight and adjust the support, so your foot touches the ground in the best possible way. Any excess friction or pressure that may have caused pain, discomfort or inflammation, is alleviated when we use a custom insole. As a team of experienced podiatrists we build on our expertise with thousands of customers and patients, as well as high performers in the area of professional sports. A comprehensive neuro-muscular and bio-mechanical assessment always shows us how we can improve a person’s feet interact with the rest of their body. We believe that we build better bodies from the feet up, and it’s a known fact that everything in our limbs and joints interacts with each other. So this improvement in the motion of your foot may also be very beneficial for your knees, legs, hips and even your lower back! How long will I need prescription orthotics for? Depending on the nature of your injury or the outcomes of your bio-mechanical assessment, we will work out a treatment plan. This may include plans to remove the orthotic at a later stage, once your foot function has improved. The orthotics have a clear function: to hold your feet in the position that we want to hold them in. Custom orthotics are widely used by our Perth customers, for the treatment of overpronation and underpronation, as well as supinated feet. How do I know if I need prescribed orthotics? If you feel discomfort, ankle pain, knee, hip or back pain or irritation in your feet, then it may be linked to an interaction with the ground that is less than ideal. Or you may have been told that you need custom insoles. The most accurate way to diagnose this is to make an appointment for a bio-mechanical assessment at The Foot Clinic. Our podiatrists will look at the exact position of your feet as you sit, stand, walk or run. This will show us how your weight is distributed and how it impacts specific areas of your feet with each step. We look forward to helping you take good care of your feet, so if you have any questions about insoles and custom orthotics, please contact us today to book an appointment! Want to know more about Orthotics? Read more about the types of customised orthotics we have available and our Naboso Proprioceptive Insoles.